Fasting blood glucose levels of 126 mg/dL (7.0 mmol/L) or greater. Documented more than once. HbA1c is 6.5% or more. Usually, the patient has associated diseases like hypertension, dyslipidemias, and atherosclerosis. Competitive inhibitors of the alpha-glucosidase enzyme in the gut. This enzyme digests starches. Hence, glucose digestion and absorption reduces. Increases hepatic protein kinase (PK) activity by increasing adenosine monophosphate levels (AMP). This, in turn, reduces hepatic gluconeogenesis and lipogenesis. 1.5h to 3h half-life. Excreted unchanged by the kidneys. Improves hyperglycemia and hypertriglyceridemia in obese patients without weight gain. In the US metformin is contraindicated at the creatinine levels of 1.4 mg/dL in women and 1.5 mg/dL in men. Therapeutic doses do not cause hypoglycemia. Hence this drug is called euglycemia or antihyperglycemic drugs instead of a hypoglycemic drug. Can cause vitamin B12 deficiency by interfering with its absorption. Lactic acidosis has been reported. 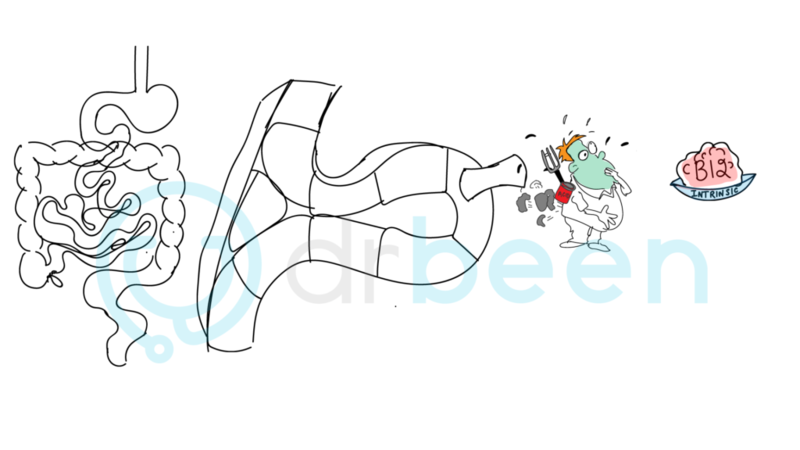 Figure: metformin blocking B12 absorption. Keep in mind that vitamin B12 deficiency can occur with long-term metformin use. First generation: Tolbutamide, Tolazamide, Acetohexamide, Chlorpropamide. 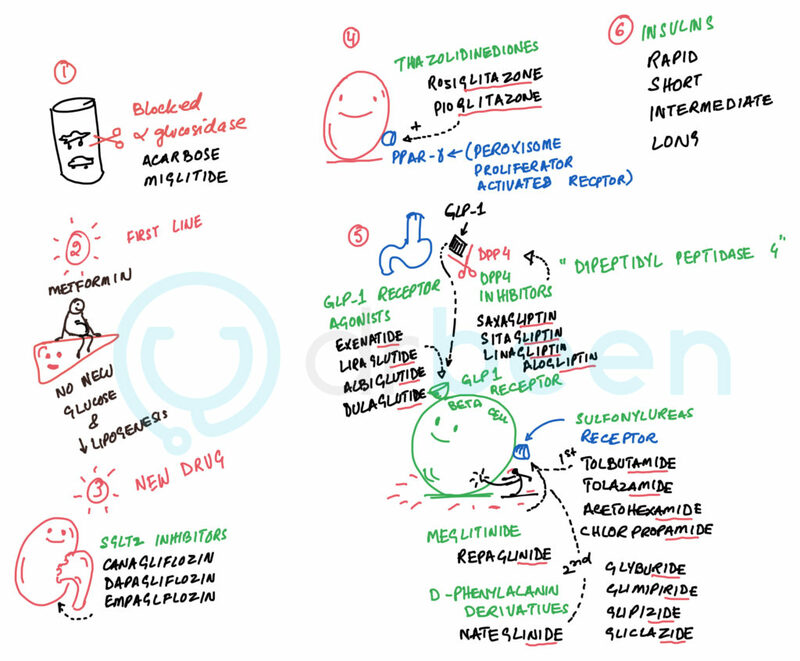 Second generation: Glyburide, Glipizide, Gliclazide, Glimipiride. More potent than the first generation. Use with caution in patients in whom prolonged hypoglycemia can be dangerous e.g. elderly or heart patients. Glyburide has the most affinity and Tolbutamide has the least affinity. Binding to the sulfonylureas receptors closes K+ channels resulting in the cell depolarization and insulin release. Used in type 2 because these drugs need functioning beta cells. Binds to the sulfonylureas receptors, closes the ATP sensitive K+ channels, depolarizing the beta cells and releasing insulin. Rapidly proteolyzed by dipeptidyl peptidase 4 (DPP4) and other enzymes. Oral glucose causes the release of gut hormones glucagon-like peptide 1 (GLP1) and glucose-dependent insulinotropic polypeptide 1 (GIP1). These hormones increase glucose-induced insulin release. In type 2 DM these hormones are reduced. Sensitize peripheral tissue to insulin. Acts on the peroxisome proliferator-activated receptor gamma (PPAR-gamma) resulting in liponectin increase and resistin reduction. Rosiglitazone is reported to increase the risk of angina pectoris and myocardial infarction (MI). Banned in Europe. Contraindicated in NY Heart Association class III and IV cardiac status. Weight gain possibly fluid retention as one factor. Long-term pioglitazone administration needs consideration for the risk of bladder cancer. 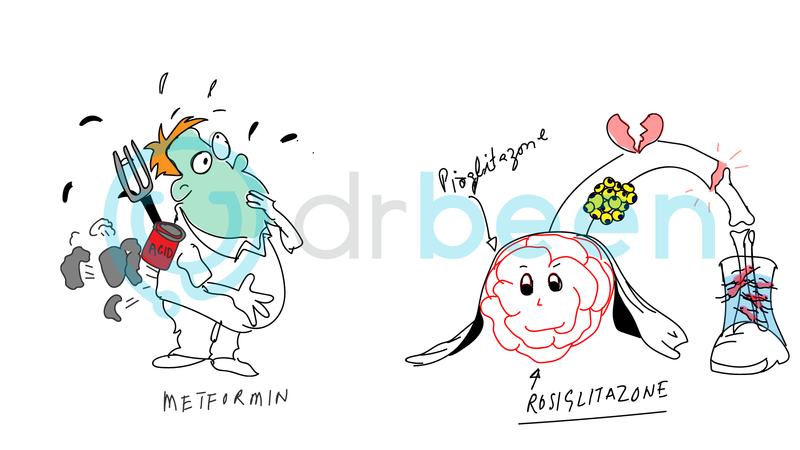 Figure: A pious (pioglitazone) rose (rosiglitazone) met a former (metformin). Remember metformin by the character on the left. He is nauseated, bloated, and has a lactic acid box. Some of the side effects of metformin. For pioglitazone and rosiglitazone see how the rose is on a broken bone (stem) this is to help you remember that fractures can occur. See the broken heart to help you remember that angina pectoris and myocardial infarction risk increases. The boat filled with fluids is for water retention which in turn is causing dilutional edema – see the RBCs swimming in this extra fluid. The yellow fat cells attached to the stem should help you remember that these drugs work on PPAR-gamma receptors to help increase liponectic and reduce resistin. Canagliflozin reduces glucose threshold from ~180 mg/dL to 70-90 mg/dL. Reduces HbA1c by 0.6% to 1%.